Here’s what’s up in the world of TV for Monday, May 23. All times are Eastern. 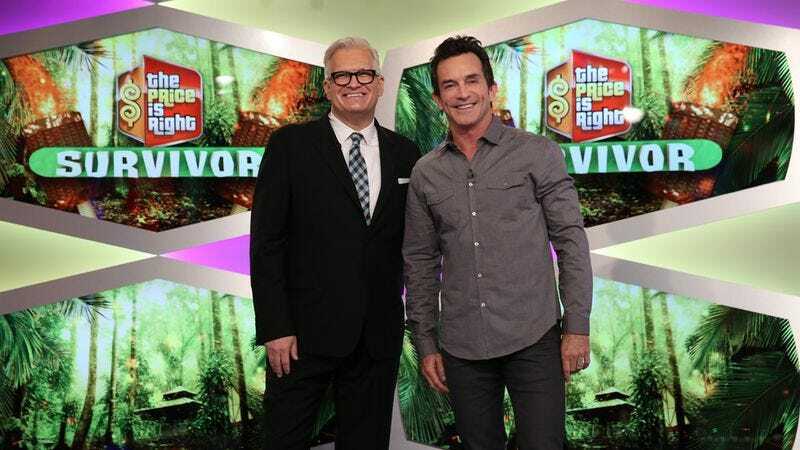 The Price Is Right Primetime Special: Survivor Edition (CBS, 8 p.m.): Survivor’s latest season may be over, but is it really over? Yes. Yes, it is really over. But CBS isn’t done with it yet, and that’s what this is all about: “The Price Is Right is going primetime—and bringing some of the hottest reality-TV stars to celebrate the three-day special event… Each special will be hosted by Drew Carey and will celebrate a CBS reality series: Big Brother, The Amazing Race, and Survivor, featuring appearances by each show’s hosts, Jeff Probst, Julie Chen, and Phil Keoghan.” Aw, yeah, Jeff Probst will be present. You know what they say: Probst is Probst is Probst. The Voice (NBC, 8 p.m.): This is The Voice! Well, it’s part one of its live finale, so that’s kind of a big deal. “THE FINAL VOCALISTS COMPETE FOR THE TITLE OF THE VOICE.” Honestly, we’ve watched enough of The Voice to know that being called “The Voice” isn’t exactly the same as being called an American Idol, but don’t tell this press release. Still: This is The Voice! The Bachelorette (ABC, 9 p.m.): UnREAL’s not back yet, but at least we have The Bachelorette, right? “Successful and stunning real estate developer JoJo Fletcher, 25, gets a second chance at her happily-ever-after, choosing from 26 handsome bachelors. After being devastated last season by a shocking rejection from Bachelor Ben Higgins, who confessed his love to both her and Lauren Bushnell, the Texan beauty is ready to leave that heartbreak behind and write her very own love story as The Bachelorette.” We’re sure she’ll find real love this time. We just know it’s going to happen. Fashion Police: The 2016 Billboard Music Awards (E!, 8 p.m.): As usual, the title says it all. Kids BBQ Championship (Food Network, 8 p.m.): We realize that you’ve chosen to title your series premiere “Meat The Chefs” in an attempt to come across as punny, but all it really does is make it seem like the kids themselves are the BBQ. What a championship. Gotham (Fox, 8 p.m.): “While Gordon, Bruce, and Lucius remain at Indian Hill, the city of Gotham will be met with a new threat as Hugo Strange’s inmates devise a plan to escape and start their new lives.” Hey guys, maybe you should do something other than “remain at Indian Hill” then. No? Fine, we’re sure Batman will… Um… Oh, yeah. Long live the “Wrath Of The Villains,” right, Kyle Fowle? The Odd Couple (CBS, 9/9:30 p.m.): First up, “Oscar and Felix run a heated campaign for president of their building’s tenants’ association, but Oscar doesn’t fully realize everything the position entails.” Come on, Oscar. Use your slob brain, man. Let’s see if he picks it back up in the season-two finale: “When Murph persuades Oscar to try online dating, Oscar finds himself on a blind date with Felix’s ex-wife, Ashley (Christine Woods).” Oscar, Oscar, Oscar. Also, Odd Couple: This is not how online dating works. Whose Line Is It Anyway? (The CW, 9/9:30 p.m.): Whose Line’s 12th-season premiere sees Alfonso Ribeiro (no, not some other Alfonso Ribeiro) as the celebrity guest, with recent House Of Lies guest star Keegan-Michael Key in episode two. Improvisational comedy! Blindspot (NBC, 10 p.m.): Tonight, Blindspot ends its first season. “Weller searches for the truth within a heartbreaking and confounding assertion. Jane reaches out to a former suspect (guest star Aimee Carrero) for help with Oscar (guest star François Arnaud). Meanwhile, the rest of the team struggle [sic] to help a friend…” We don’t know about you guys, but we think that “struggle to help a friend” might be more than meets the eye. Maybe that’s the true blindspot, after all. Buffy The Vampire Slayer, “I, Robot… You, Jane” (Hulu/Netflix/Amazon Video): I’m jacked in. I’m jacked in. I’m jacked in.